The National Law Enforcement Officers Memorial Fund enjoys the support of a special group of volunteers: Law Enforcement Ambassadors and Guardians. Law Enforcement Ambassadors are active and retired law enforcement officers from city, state, federal and military law enforcement agencies, while Law Enforcement Guardians are volunteers who support and honor law enforcement but are not sworn officers, allowing citizens, family members and corporate supporters to work closely with the Memorial Fund in achieving their goals. This month we recognize Carl R. Peed, a long-time supporter of the National Law Enforcement Officers Memorial Fund and the National Law Enforcement Museum. Even before the Museum capital campaign began, Carl supported our work and contributed efforts to honoring law enforcement. Through Carl’s leadership and vision, he helps identify individuals and companies that the Memorial Fund staff can contact to help raise awareness and funds for our mission. Carl has a long, respected career in law enforcement and criminal justice. He founded CP2, a Virginia consulting company, after retiring as director of the U.S. Office of Community Oriented Policing Services (COPS), which he was appointed to by Attorney General John Ashcroft in 2001. At COPS, he managed the organization that supports state and local law enforcement nationwide. Prior to COPS, he served as the Director of Juvenile Justice for the Commonwealth of Virginia, a statewide agency, where he was responsible for developing policy and providing administrative oversight for 38 regional offices and more than 110 local and state facilities. 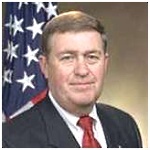 Previously, he served as the Sheriff of Fairfax County (VA) for 10 years. He was elected to office three times beginning in 1990. As Sheriff he developed professional policies that received national and international recognition. He also introduced new technologies to the criminal justice system. Carl Peed is a family man and a resident of Oak Hill, Virginia. He has a Certificate of Criminal Justice Administration from the University of Virginia and is a graduate of the FBI National Academy, the National Institute of Corrections, and the National Sheriffs Institute. We are honored to have him as part of the Memorial Fund team. If you would like to contribute to the Memorial Fund's efforts in your own way, please contact John Shanks at 202.737.8529 or JShanks@nleomf.org.